Writers should always think carefully before killing off any character - just because somebody's a joke today, it doesn't mean a good writer won't be able to turn it around. When the thrill of big game hunting becomes too boring, one-time millionaire and spendthrift Thomas Blake takes to a life of crime. He uses his skills as a hunter and tracker to become a notorious burglar, known early on for lifting valueable art and jewels. Wearing a cat-costume made from an ancient cloth believed to grant its wearer nine lives, Catman carries an array of weapons on a utility belt - similar to his heroic foil and inspiration, Batman. Later, Catman becomes a member of the amoral villainous unit known as Secret Six, taking part in a variety of dastardly crimes. Catman was created in 1963 by Bill Finger and Jim Mooney. This was back when Kathy Kane was running around as the original Batwoman, and since Batman had Catwoman to chase, it only made sense that Batwoman would have a Catman. He was yet another in a long line of villains styled as "the anti-Batman," and was quickly relegated to D-list status. He appeared in a few issues of Green Arrow and was shown as a fat slob, and even seemed to be killed off. But really he'd retired from society, moved to Africa and lived on the veldt with a pride of lions, where he would have been happy to stay, until he rejected Deathstroke's offer to join the SSoSV and his lions were killed to send him a message. Big mistake. 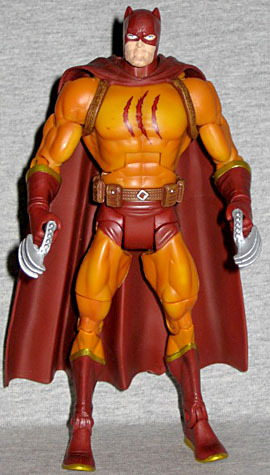 Though he's part of the "Batman Legacy" line, Catman uses one of the standard DCUC bodies - the same one as Sinestro Corps Batman, in fact. He has a new cape, with straps that run under his arms, and a utility belt that's unique to him. The tops of his boots are sculpted, and he has new gloves with a band sculpted near the top and a triangular cutout in the back. His feet are entirely new, as well, with a ridge sculpted around the soles, the toes curved up slightly instead of sitting flat on the ground, and a ridged texture on the sole for traction - these definitely look like the shoes of someone who'd be doing a lot of climbing and jumping. The head is a new mold, as well. Even if they'd wanted to repaint a Batman head, the ears would have been the wrong shape. The short ears are actually a bit cute, but that impression is certainly deflated by the sculpted stubble on his chin. Read that again: he has sculpted stubble! Awesome! The head is a little too small on his body - it could stand to be about 10% larger. Articulation is the standard you've come to expect from Mattel, with no surprises: balljointed head; swivel/hinge shoulders; swivel biceps, wrists, waist and thighs; hinged elbows, torso, knees and ankles; and H-hips. 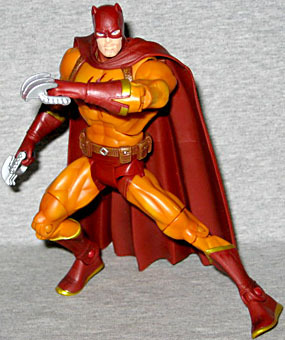 Catman originally took his design cues from Catwoman's first costume, which was a yellow dress with a red cape. (He also looked suspiciously like Holyoke's Cat-Man, too, but we'll let you draw your own conclusions about that.) These days the colors are just a bit darker, so it's more like an orange suit with brick red cape, gloves, trunks and boots. There's gold trim on the gloves and boots, which adds just a bit of flair to the design. Judging by this character sketch, Dale Eaglesham was apparently considering a purple costume with an orange cape, but thankfully that didn't happen. The logo on his chest is crisp, but the gold bleeds a little. The Batman Legacy figures come with a small display stand, a 3½" x 2" x ½" oval with a raised Batman symbol and a recess in the front with the character's name. There's also a mini-poster featuring the art from Secret Six #2 without any trade dress. 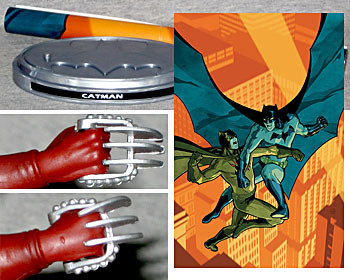 Catman's only accessories are his two claw weapons, which are meant to be like brass knuckles, but they're designed so the figure can't actually hold them anywhere near his knuckles. Okay, he kind of can, if, instead of putting the handle in his hand like a sane person would, you jam his fist in there and hook the handle behind his thumb, but that's stupid. After Deadshot and Bane, it's nice to get another member of the Secret Six (though we could still use plenty more). The figure is made nicely, with just a few minor quibbles in the form of his head and accessories. He's part of Series 2, along with Batgirl and Golden Age Batman, but he's easily the best of the bunch. Catman's never had any sort of toy before, so it's nice that his inaugural trip to plastic has turned out so well.